Bàsquet Manresa, S.A.D.,, also known as Baxi Manresa for sponsorship reasons, is a professional basketball club based in Manresa, Spain. The team plays in the Liga ACB. Their home arena is the Pavelló Nou Congost. Bàsquet Manresa has won the Spanish Championship once, in 1998. Joan "Chichi" Creus is the team's most decorated player; he was the Spanish Cup Most Valuable Player in 1996, and the ACB Finals MVP two years later. Some others well known players that had played for Bàsquet Manresa are Juan Domingo de la Cruz, Roger Esteller, Derrick Alston, Serge Ibaka, Andrés Nocioni, Rolando Frazer, and the Basketball Hall of Famer George Gervin, that at the age of 38 spent one year in the team, averaging 23.1 points and helping them to avoid the relegation from the Spanish top division. 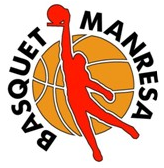 Bàsquet Manresa was founded in 1931 with the name of Manresa Bàsquetbol Club and merged in 1934 with Club Bàsquet Bages for becoming Unió Manresana de Bàsquet. In 1940, the club wins the Copa Barcelona and integrates in CE Manresa as its basketball section. In 1968 the club promotes for the first time to the Liga Nacional but is immediately relegated again in its debut season. Two years later, Manresa played again in the top tier and ended the league in the fourth position, thus qualifying for the first time to play the Korać Cup, where it reached the quarterfinals. In 1979 the club splits from CE Manresa and becomes Manresa Esportiu Bàsquet and grew up until becoming a usual contender in the Liga ACB. With the sponsorship of TDK between 1985 and 2000, the club lived its best years. In 1992, as a professional club and according to the law, Manresa becomes a Sociedad Anónima Deportiva and changes again its name to Bàsquet Manresa. This name change allowed Manresa EB and its former rival CB Manresa to merge definitively. In 1996, Manresa wins its first national trophy by defeating FC Barcelona in the Copa del Rey played in Murcia. Two years later, and after finishing the regular season in the sixth position and without the home-court advantage in any of the playoffs series, Manresa wins the 1997–98 Liga ACB after eliminating Adecco Estudiantes in the quarterfinals and Real Madrid in the semifinals, for winning in Tau Cerámica Baskonia 3–1 in the finals. As in the Copa del Rey won two years ago, Joan Creus became the MVP of the finals. This achievement is nowadays considered on the biggest surprises in Spanish sport ever. As league champions, Manresa played the EuroLeague, but was eliminated in the group stage. The golden era of the club suddenly ended in 2000, after the relegation to Liga LEB by losing in the do-or-die match against Gijón Baloncesto, that ended 95–91 after an overtime. Since its relegation, Manresa started to alternate seasons in ACB and LEB, with two league promotions in 2002 and 2007, as LEB champions. In 2012 and 2013, Manresa suffered two relegations in Liga ACB, but remained in the league due to the impossibility of LEB Oro teams to promote. In 2017, after registering the worst season in the top tier since the 1983–84 season, Manresa relegated to LEB Oro. However, the club achieved promotion just in the next season after beating Club Melilla Baloncesto in the final of the playoffs. Pavelló Congost (1968–92), before 1968 the team played in not domed courts next to the football stadium of Pujolet. ^ Remained in ACB after Ford Burgos and Lucentum Alicante did not complete the requirements for joining the league. ^ Remained in ACB after Ford Burgos did not complete the requirements for joining the league. ^ "Relación de SAD — Portal del Consejo Superior de Deportes" (in Spanish). Consejo Superior de Deportes. Retrieved 1 July 2018. ^ "El TDK conquista la Liga ACB" (in Spanish). El País. 5 June 1998.